The Little Engine That Could comes to life all over again in this gorgeous oversized picture book with foil on the cover and the beautiful art from the 1950s. A train of toys desperately need an engine to take them over the mountain so that they can deliver toys and food to children. But none of the big, important engines will help them. Luckily, the Little Blue Engine comes along. She is small, but she has confidence that she can do it?and she does! Grosset & Dunlap and Penguin Young Readers Group are proud sponsors of Starlight Children?s Foundation. 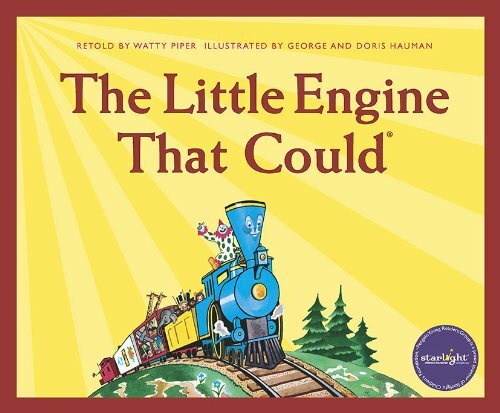 Grosset & Dunlap will make a donation from the sales of this edition of The Little Engine That Could to Starlight Children?s Foundation, enabling the organization to continue to make a world of difference for seriously ill children and their families. About George and Doris Hauman (Illustrator) : George and Doris Hauman is a published illustrator of children's books. A published credit of George and Doris Hauman is The Little Engine That Could.